The supplementary information from 1710 reveals that in the alternate history, the Charles River was diverted and the running loops distances were altered. Rounding the distances of the loops in the original history to the nearest mile and reading alphanumerically gives the answer MECHANICAL IMPEDANCE. In the alterniate history, reading the decimal parts of the distance of each loop (the part that would be rounded off when rounding to the nearest mile) alphanumerically in pairs spells DAY FOURTEEN PLAQUE WILLIAM A BILLINGS TITLE. 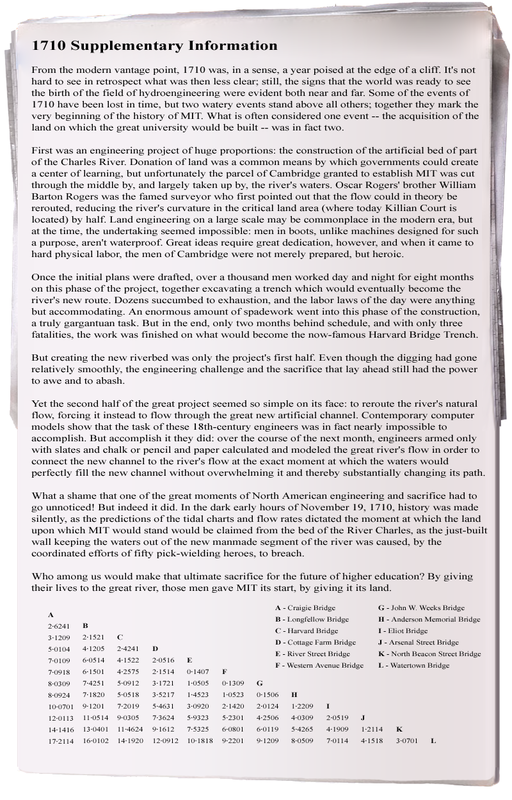 Going to the plaque on the south end of the Harvard Bridge reveals that William A. Billings was the DEPUTY CHIEF ENGINEER.